A couple weeks later I attended a 2-hour symposium at the annual Food and Nutrition Conference of the American Academy of Nutrition and Dietetics in San Diego entitled, The Family Meal: Reclaiming the Dinner Table. One of the presenters, Adam Drewnowski PhD, of the University of Washington, noted that the groups least likely to engage in family meals are teens and young adults, those who arguably stand to benefit most. While it didn’t make me feel better, clearly my family wasn’t alone in this dilemma. In a paper, The Family Meal: Benefits of Eating Together, written by Drewnowski and Fiona E. O’Farrell, multiple findings show that overall self-efficacy and problem solving skills were higher in teens and adolescents who ate regularly as a family. One study found that teenage females in families engaging in regular family meals had lower eating-disordered behavior and body image concerns. Other findings show that teens having five to seven family meals a week were less like to smoke, drink or use drugs compared to peers who had less frequent family meals. It pays to start a family meal tradition early. If introduced at an early age, the family meal is a ritual that all family members look forward to. Family meals may help young children accept a wide variety of fruits and vegetables, be less picky about foods, improve their vocabularies and communication skills and learn new responsibilities as they help prepare the meal. How about adults? Family meals can help create a balance between work and home life, offer a chance to model and lead by example and an opportunity to cultivate family togetherness and cohesiveness. It takes planning and effort in today’s busy, distracted world to carve out family time at the table. Sifton dines out many days of the week in order to deliver stellar New York Times restaurant reviews, but he still makes time for family meals. As my children have grown into young adults we’ve become more creative and flexible with our meals, too. It might mean meeting for a special lunch or dinner out, with just Mom, Dad or the whole family. And I have no shame in exploiting the fact that my kids love good food and will occasionally entice them from their busy social lives to the table with the promise of Dad’s homemade meatballs or another favorite dish. While we don’t eat together as often as we used to, the conversations are often richer now that our children are older. My daughter recently reported that a discussion at the dinner table gave her ideas for a history test essay – and she aced it. Another incentive to show up for meals! We’ve also expanded our mealtime to weekend brunch, and this recipe for double-wheat buttermilk waffles is often requested. It’s a large recipe, which can be halved, but you’ll want to invite a crowd to enjoy them! Make-Ahead Note: Extras freeze well and can be reheated in the toaster for a quick weekday breakfast. Just add a smear of peanut butter and jam or another favorite topping. Togetherness Tip: Call in another family member to help make the waffles. 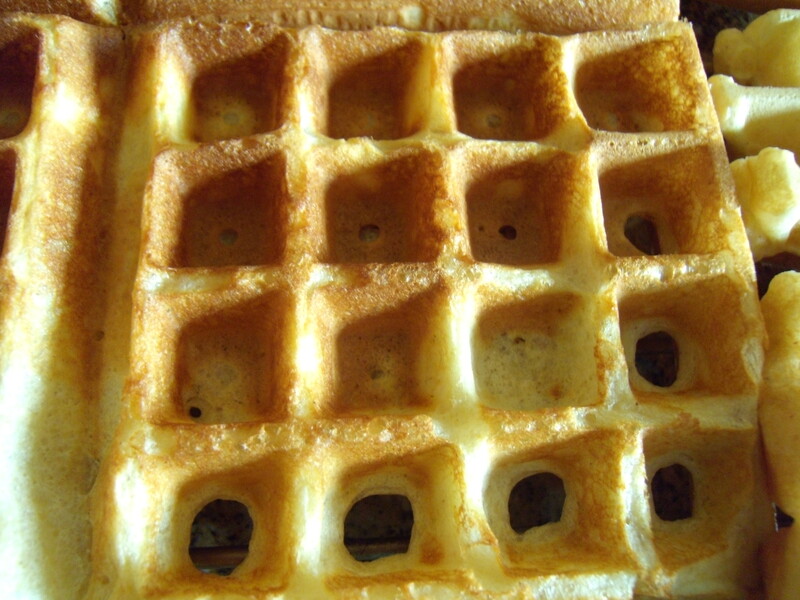 Homemade waffles are infinitely tastier than any mix, which are often high in sodium. The whole wheat pastry flour in this recipe keeps the texture of this whole grain recipe light. In large mixing bowl, combine pastry flour, unbleached flour, wheat germ, sugar, baking powder, soda and salt. Break eggs into a separate large bowl and beat lightly with a whisk until blended. Whisk in buttermilk and oil. With a wooden spoon, make a well (hole) in the center of the dry ingredients. Slowly pour liquid mixture into well, stirring just until blended. Preheat waffle iron. 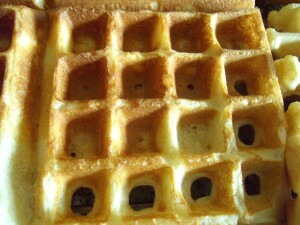 Lightly brush waffle iron with oil. Bake waffles according to manufacturer’s directions. Makes about 16 (4-inch) waffles. Crazy about cooking, eating and sharing good food – my work and leisure revolve around the kitchen. As a culinary dietitian my professional life encompasses nutrition counseling and education, recipe development, product development, food and nutrition writing, marketing communications, corporate test kitchen and consumer affairs management, food styling and work as a product spokesperson. Get healthy updates in your inbox. Lorelle combines a passion for the culinary arts with solid knowledge of nutrition and experience in communications to create truly innovative food communications and marketing solutions.